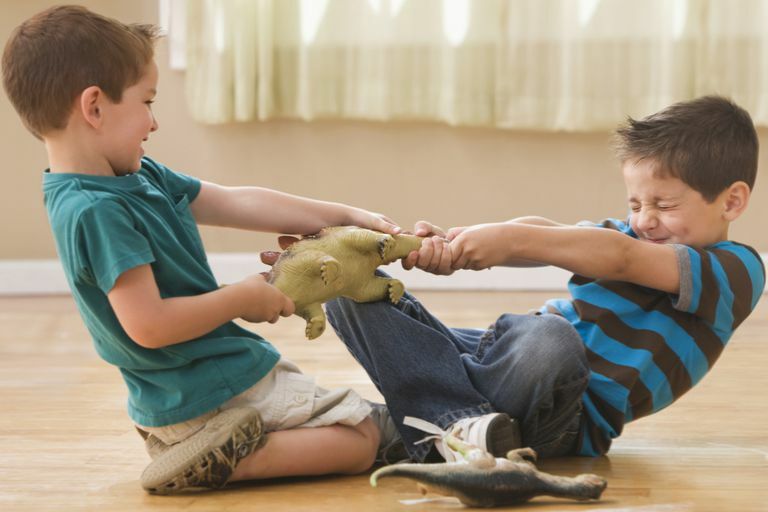 Toddlers and small children have earned a reputation for being rambunctious, but parents can teach kids to stop roughhousing and play more gently. With a little practice, you can teach your child to face younger siblings, playmates, and pets with a softer touch. There are many reasons why you wish to have your toddler or small child learn to play gently. If your child is having a play date, you may be worried about roughhousing. Your family pet may be longing for you to invest time in practices to promote gentle touch. And for parents expecting another baby, concerns about the roughness of your child's play may be at the forefront of your mind. After all, toddlers don't necessarily know how to behave properly around newborns, puppies or even peers. Adults, however, can demonstrate and teach calm and gentle behavior. Here's how to do it. Role play is a great way to teach children with a hands-on approach, and with young children is usually much more effective than words. If you're expecting a new baby, have your child practice how to be gentle using a doll or favorite stuffed animal. In addition to modeling the behavior, it's important to explain to your youngster why she needs to be gentle. You may want to begin by discussing (and demonstrating on the doll or stuffed animal) why an infant's back and neck need to be supported. Kids are curious and will react better if they understand that an infant is not capable of holding her head up on her own. You can even begin to praise your child for her new role as big sister (or big brother) as she shows you how she can handle her doll or stuffed animal. Too many toddlers learn gentle touch but startle their newborn siblings or pets by making frenzied movements or using shrill voices. Teach toddlers to exhibit calmness and gentleness through slow, controlled motions, soft voices, and gentle touch. Demonstrate how toddlers should touch babies (include when and where as well) and how baby animals should be petted. Teach them to approach playmates in the same manner. Parents should teach small children that neither their peers nor older children or adults enjoy being poked, prodded, yelled at, or kicked, even during playtime. Kids learn best by example. As a result, adults should use calm and gentle tones and actions if they want their children to do the same. If parents behave in a gentle manner, toddlers will understand how it feels to be yelled at versus how it feels to be spoken to gently. If parents constantly yell or make a frenzy, toddlers won't learn to behave otherwise. As a parent, it can be intimidating knowing that you are modeling the behavior your children will adopt each moment of every day. Yet if you look at this another way, it means that you are in control of much of what your child will mimic, and instructing your child in gentle behavior is sometimes as simple as modeling it yourself. While parents should lavish praise on their children for behaving gently, they should avoid the temptation to criticize youngsters for behaving rambunctiously. Positive reinforcement is more effective than negative reinforcement in effecting change in our children. Try not to tell a toddler that he's doing it wrong; instead, offer better ways to practice holding a doll or stroking a puppy's fur. Don't place excess pressure on a youngster about behaving gently. Give your children lessons about gentleness gradually over a length of time, and realize that even you as a parent can take time to master a new behavior. You can easily double your efforts to teach your child to be gentle with your camera. By photographing your little one with playing gently with his new puppy or newborn sibling, you can reinforce gentle behavior. When your child learns how to be gentle with small pets and babies, show the picture off to teachers, family and friends to instill pride in your toddler. Teaching your child to play gently is a process that will continue throughout childhood and doesn't happen overnight. That said, some children may have difficulty learning to play gently. There are a number of medical conditions which could be influencing your child's behavior if she just doesn't seem to be learning over time. Talk to your pediatrician if you have any concerns. Gentleness is a learned behavior. You can help teach your child to be gentle by modeling the behavior yourself, by having your child role play with a doll or stuffed animal, and by helping your child to be aware that her movements and tone of voice are just as important as gentle touch. With proper parenting guidance, kids will usually master the calmness needed to be a doting sibling, friend, or pet owner. What Should Parents Do When Siblings Fight?